If you have children who love Lego, you have probably been in the same position as I was in on how to find a way to organize all of those plastic blocks. My Son has become addicted to Lego and I felt that those little blocks were overtaking our playroom. Everywhere I looked there were more blocks and more blocks. I needed to find a way to organize them before they took over our life. ....and I fell in love. This was exactly what we needed to tackle the Lego which was overtaking our playroom. 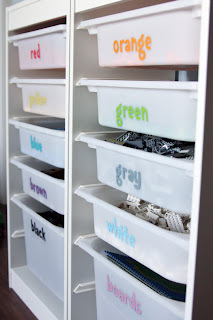 Jen from i heart organizing had come up with this idea to tackle her own Lego organization. For anyone that knows me, once I have an idea in my head that needs to be accomplished, I won't rest until it is done. We went to Ikea to purchase the Trofast storage units and bins so that I could get the Lego under control yesterday while my son was at school. I used 2 trofast units, and used my label maker to label the bins. This solution was perfect and when my son came home from school he was really excited that he could see all of his lego and that it was organized into bins by colour. In Total this project cost us just under a hundred dollars which I think is pretty good. As well, if by chance my son stops playing with Lego, these storage units can easily be converted into storing other items or toys.